Rhonda lookin' all snazzy in the bike shed. I couldn’t stop smiling as I cycled home (even getting lost was fun with my new companion) and I knew this lovely lady in red and I were going to have some wonderful times ahead. That evening I decided to meet up with my friend Samuel who recently moved back to Amsterdam and we decided to have a “few” beers. Now for the sake of a good euphemism and because I know my father will read this blog, I will say I was mildly “wobbly” after beer number 5 and I stumbled out of “The Minds” (Which is on Spuistraat and very cheap compared to other bars in the city) in a rather unsteady fashion. After only a few minutes of cycling I had a beer induced collision with a taxi-bike and was thrown off my own one onto the not so comforting gravel road. With a bit of a thud, my bicycle landed on top of me (and gone was the ability of the “crank” – the part that holds the chain in place- and my pride!) The only positive thing about being tipsy at the point of crash was that I didn’t immediately feel the cuts and bruises or the embarrassment. Those joys arrived when I awoke. 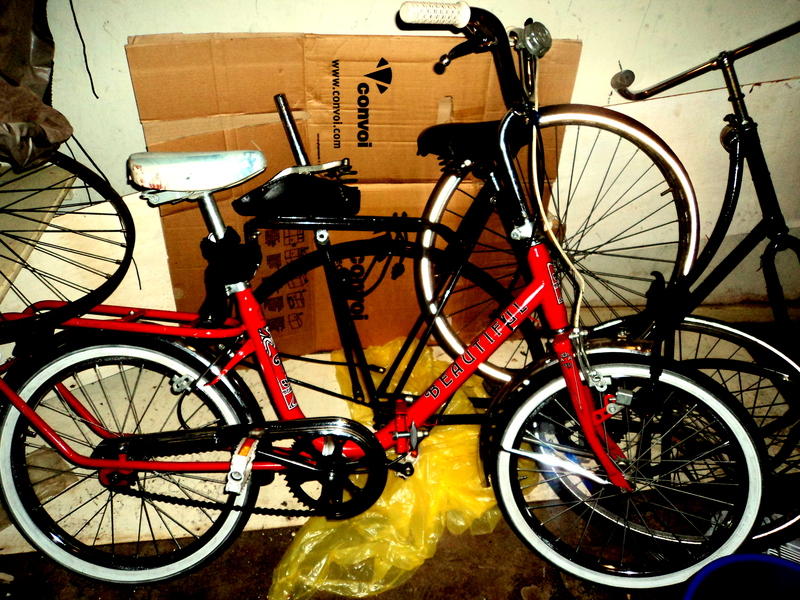 I went to fetch my lil’ bicycle (she really needs a great 1970’s name like Rhonda or Mindy!) at 5 o’clock and Mr Bike man had done a sterling job. With a pat on the back and a set of free headlights (man, he must have thought I was a seriously duff driver) he sent me on my way, and I cycled home smoothly feeling pretty chuffed! In future however I will avoid the beer and bicycle combination! At least until I can properly drive the damn thing, or handle my booze.